With the intuitive Fitbit FB201W Aria WiFi Smart Bathroom Scales you can keep track of your weight in a way that's convenient for you. The Fitbit Aria WiFi Scales make monitoring weight simple - they connect to your wireless home network and automatically load measurements to your private online dashboard and the free mobile app. The scales accurately record weight, body fat and BMI measurements that can then be viewed on your PC, Mac or smartphone. The Fitbit Scales can be used for the entire household too, you can set up to 8 accounts to share and compare your progress online. You can keep your profile up-to-date as you log your food and activities regularly from your smartphone, making it easier to monitor your self-set targets and food allowances. Set yourself long term goals and utilise the online graphs and achievement badges via the Fitbit dashboard. The Fitbit Aria Scales are also compatible with a range of popular fitness apps including My Fitness Pal, Endomondo, Map My Fitness and Tactiohealth. 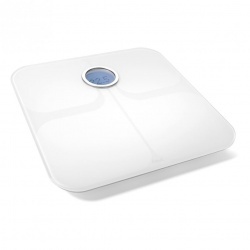 Monitor your weight effectively with the Fitbit FB201W Aria WiFi Smart Bathroom Scales.